Ham salad or deviled ham is seemingly pedestrian, but man, is it good. Just as a rotisserie chicken can be transformed by dijon mustard, tarragon and apples, into sumptuous chicken salad, so too can baked ham be blended into deliciousness with rosemary, shallots and mayonnaise. To truly make this some devilish goodness, add some paprika and cayenne to make things a little more fiery. We used to make this after Easter with the tons of leftover ham from the feast the day before. 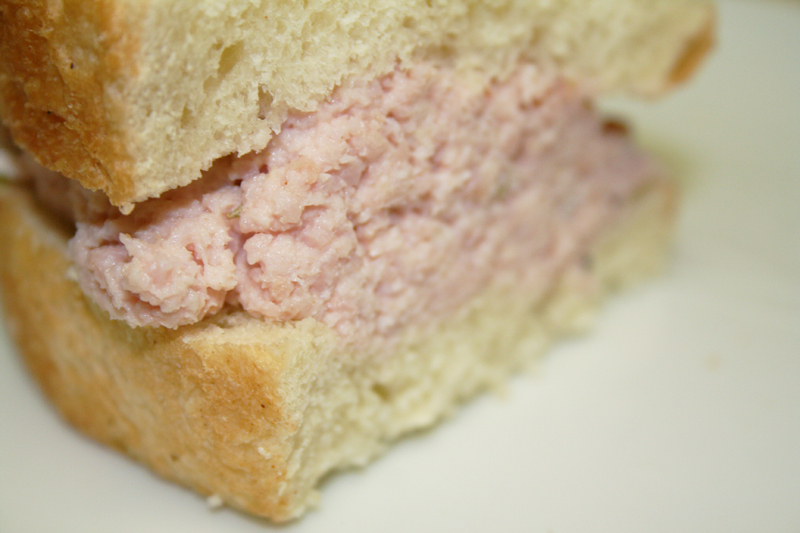 It kept incredibly well in the fridge for quick sandwiches and was always a treat…for as long as it lasted. This recipe makes a pretty dry salad, like I like it, but if you want things a little more moist, add a few more tablespoons of mayo to smooth things out. In a food processor, blend all ingredients until smooth. Spread on crackers or eat as a sandwich spread on crusty bread. My mom makes this with pickle relish. We used to love it when we were kids.